President Obama’s announcement that federal workers’ pay should be frozen for 2 years generated headlines, but won’t accomplish anything if enacted. It pre-empted Republican Teabagger headlines in January, true. But being President should be about more than generating headlines before the other party. It’s about demonstrating leadership and proposing policies based on a vision. The reason for proposing this ostensibly is due to “deficit concerns”. The policy would save a whopping $5 billion out of a $2000 Billion deficit over 2 years. In other words, it is not a serious solution. Everything being discussed by the D.C. establishment (which is solidly pro-corporate) in terms of the deficit will not reduce the deficit. What continues to remain undone is a serious policy to address the employment crisis in this country. Another chance to provide leadership has been passed up by this President. I know why Democrats were drubbed in the 2010 elections. Does the President? It can’t be argued that imposing a $60 billion penalty on middle class workers — which is exactly what this is — will do anything but retard economic growth and reduce job production. This policy will worsen the crisis that actually exists: the unemployment crisis. Bravo, President Obama. Categories: economy | Tags: deficit, right-wing policies, unemployment | Permalink. Two news stories caught my eye this weekend dealing with Smart Grid projects. Smart grids are being researched and developed to connect residents and businesses with utility companies. Based on the thought that people tend to reduce usage of resources when presented with that information in real-time, smart grids are envisioned as a way to help bring our wasteful energy use down. I hold the opinion that they are a critical development in solving our climate crisis. Serving as a foundation to introduce applications for people to directly affect their energy usage on a minute-to-minute basis if they choose, incorporating plug-in vehicles to act as energy storage and delivery systems and pulling together demand-site and utility-scale energy generation technologies, smart grids need to be developed and deployed to every city as quickly as possible. But haste makes waste, as the saying goes. On the way toward deploying smart grid technologies, robust systems that are well-planned and installed as advertised are obviously important. That brings me to the first story: Xcel, critics await PUC’s smart-grid rate ruling. A little bit of background: back in March 2008, Boulder, CO was announced as the first city where smart grid technologies would be deployed. Originally, 15,000 smart grid meters were to be installed by Aug. 2009, with 50,000 meters installed by Dec. 2009, at a cost of “up to $100 million”. I noted back in March 2009 that Xcel was running into some delays and that hard projections were becoming scarce to locate. That trend has continued. There is plenty of information available to participants in the program, but Xcel has understandably not advertised the kind of information they were when the program was announced. As best as I can figure out, there are far fewer than 50,000 participants in Boulder’s smart grid program today. Categories: energy, global warming, politics, science | Tags: CO Public Utilities Commission, DOE, smart grid, smart grid citites, Smart Grid City, Xcel Energy | Permalink. If you’ve experienced Colorado weather since this summer, you’ve probably noticed that we’ve been warmer and drier than normal. The monsoon never really kicked in; September 2010 was the 112th warmest and 18th driest (out of 116) September on record; October was the 102nd warmest October on record (with average precipitation state-wide); November is going to come close to average for temperature, and could do so for precipitation, though the northwest mountains have received above-average precipitation while the Front Range continues to track well below average. Colorado tends to be warmer and drier under La Nina conditions, as this pdf from the Boulder NWS office shows (esp. pp 12&18). Coincident with this La Nina, which should abate by next summer, is even more snow for northwest Colorado and more warm & dry conditions southeastward from there. 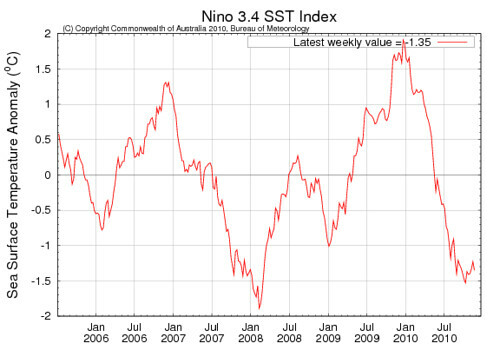 A few notes for those interested: The last El Nino event was the strongest on record since 1997-98. The last El Nino’s strength and durations wasn’t forecasted particularly well by the suite of models used to do such things. The current La Nina’s strength was much more accurately forecasted, although the rapidity of regime change wasn’t handled quite as well. Neutral El Nino/La Nina conditions should return by next summer or fall. ENSO continues to be one of the strongest causes of monthly and seasonal temperature and precipitation trends. Underlying ENSO and other oscillations is global warming, which is already directly affecting the Arctic and will show up more prominently at lower latitudes in coming years. The effects on ENSO and other oscillations by global warming is an area of ongoing research. Categories: global warming, science | Tags: El Niño, global warming, La Nina, precipitation, temperature | Permalink. What will the pro-incrementalists say? $86.2 million were given to the U.S. Chamber of Commerce by the largest health insurance corporations, which the Chamber used to undermine health care reform legislative efforts in 2009 and 2010. As eventually became clear, but not until too late, health care reform became a Health Insurance Giveaway orchestrated by Democrats and opposed by Republican Teabaggers who were only hell-bent on destroying the Obama Presidency. They Republican Teabaggers could give a fig leaf less whether the legislation passed or not, or what form it took. They’re only interest is in putting a Teabagger back in the White House and continuing this country’s march back to the 1750s. On the Democratic side, I read and talked to folks for months who advocated taking a small chunk, any small chuck that could be salvaged from the gutter and declaring the first step toward health care reform taken. Incrementalists were happy to point out that health insurance corporations were supposedly in negotiations with President Obama and Congressional Democrats in an effort to help pass health care reform. This news publicizes the lie behind that duplicitous sham. I’m sure the incrementalists will say now that those millions of dollars didn’t make much of a difference, that reform was successfully attained. I think it demonstrates how patently absurd it was for any Democrat to believe that the health insurance companies were negotiating with Obama and Democrats in good faith. They got exactly what they wanted at the end of the day. Can the same be said for most Americans? I suppose the rest of us should thank the incrementalists for helping ensure 34 million Americans will be forced to purchase insurance from private insurers but remain without any public option that would help drive costs down. Or, we can stop listening to the incrementalists and stand up more forcefully for what we want – on health care and other issues. Categories: health care, politics | Tags: health care reform, health insurance giveaway, incrementalism, US Chamber of Commerce | Permalink. This is the Republican Teabaggers’ first brilliant stab at legislating since the 2010 election? Trying and failing to defund NPR? Where are the jobs, Rep. Boehner? Categories: economy, framing, media, politics | Tags: NPR, Republican Teabaggers, right-wing extremism, where are the jobs | Permalink. If Bush’s Millionaires’ Tax Cuts are extended by this Congress or the next, it will be TARP II. And we know how well the the first round worked out for Americans that actually work for a living. Categories: economy, framing, politics | Tags: Bush tax cuts, millionaires' tax cuts, TARP, TARP II | Permalink. I’d like to save you folks in the White House a whole bunch of trouble. When you all look for your souls, you had better find something that looks like JOBS. That is your soul. Your soul is JOBS. Your soul is not a smooth, orderly process. Your soul is not bipartisan compromise with Republicans. The GOP could care less about “changing the ways of Washington.” What independents care about right now is results. Results = jobs. Plain and simple. I simply can’t state it any better: When the White House looks for souls, they had better find JOBS. That’s it. That’s what Americans want. Period, end of story. Categories: economy, meta, politics | Tags: brooklynbadboy, jobs, President Obama | Permalink.